London - South Africa's Oscar Pistorius returns to the track on Wednesday, days after he suffered his first 200m defeat in nine years and complained that his competitors had an unfair advantage. The 25-year-old star, the most high-profile athlete at the London Games after he became the first double-amputee to compete at the Olympics last month, is out to defend his T44 100m title and goes in the heats from 21:00 (SA time). Organisers have billed the showpiece straight sprint as the race of the competition, with all eight finallists capable of running under 11secs. The field includes Britain's Jonnie Peacock, the current world record holder with 10.85sec. Peacock, 19, lost his right leg below-the-knee to meningitis at the age of five, and trains under Dan Pfaff, who coached Canada's Donovan Bailey to Olympic 100m gold in Atlanta in 1996. 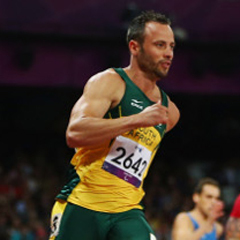 Pistorius won the T44 title in Beijing four years ago in a photo finish from his great rival Jerome Singleton of the United States, a former National Aeronautics and Space Administration (NASA) intern who won silver in Beijing. But the "Blade Runner", so-called because he runs on carbon fibre prostheses, has warned that winning gold again will be tough because of the progress made in the event over the last four years - and because it is not his favoured event. He told a news conference in London last week that any one of the eight finallists could win, adding: "If I can finish in the top three I will be happy. It's important to note that I haven't run a 100m personal best in five years. "It's not really my event. As Jonnie and those guys focus on the 100, my focus is on the 400, on the complete opposite side of the spectrum when it comes to sprinting." Even more focus will be on Pistorius on Wednsday after he lost his T44 200m title on Sunday to Brazil's Alan Oliveira and then claimed his fellow competitors were "a lot taller" and he was unable to compete with their stride length. Pistorius, a double below-the-knee amputee since childhood, said he had raised the issue with the International Paralympic Committee (IPC) but it had fallen "on deaf ears". Oliveira, 20, also goes in the 100m, as does US sprinter Blake Leeper, who took the 200m bronze. He is coached by 1984 Olympic 800m gold medallist Joaquim Cruz of Brazil. The IPC have said they would meet the sprinter to discuss his concerns but insisted that all eight finalists' prostheses, which have to be proportional to body length, were within the rules. The governing body on Tuesday said they would not be taking disciplinary action against the sprinter for his comments, which re-opened the debate about the fairness of athletic prostheses. Pistorius himself had to fight to convince the International Association of Athletics Federations (IAAF), which governs non-disabled races, that his J-shaped "Cheetah" blades did not give him an advantage.